I will still author and maintain this thread, even though there is a new thread over on the Elysium forums (link) that was posted by g2nightmare, he can have it. Lets keep this thread the best all in one stop for our brother and sister warlocks. Having leveled 4 locks to 60+ (this one on Nostalrius being my 4th) I can definitively say that the following spec progression is the fastest, safest, with the lowest downtime. The following is a PURE PvE leveling spec, focusing on quests and mob grinding. Generally, you can easily take on 2 mobs at once. One is DoT'd and VW tanked, while the other is DoT'd and running around feared. 3 mobs can be a bit trickier, One DoT'd and tanked by VW, the other body aggro'd on VW, the third DoT'd and running around feared. The only difference between taking on 2 or 3+ mobs is that you CANNOT use any life gain spells (Drain Life or Siphon Life) as you will pull 'healing aggro' from the unfocused mob. * These two points you can put anywhere. Some people like Curse of Exhaustion, some like Imp Curse of Weakness. It really doesn't matter, they are points needed to be spent to unlock the next tier. Always have your VW out while questing and/or grinding, nothing else. If its a longer kill (> 20 seconds): DoT with Siphon Live, CoA, and Corruption. Only reapply Corruption if needed, as reapplying CoA/Siphon Life is not mana efficient (unless the fight is 50+ seconds long). Level 35 - Knowledge of the Orb of Orahil - Make sure you go the The Completed Orb of Dar'Orahil route and take the orb!. This will last you quite a long while, and the active use isn't that bad. The following is your Drain Soul Macro. This is what you will use in place of Drain Soul once you get a soul shard bag. It will delete the item (soul shard) in the bottom right corner of your left most bag, which normally would be our soul shard bag. If the bag is not full, it wont delete anything. You should be using this macro/spell to kill every mob you are fighting. This will give you a nice 10 second buff that will give you a nice little chunk of mana. Between levels 37 and 44, buy or have made every piece of shadoweave. It is a good base set that will improve your damage. You can start replacing pieces if you find something with both Int and Spirit. 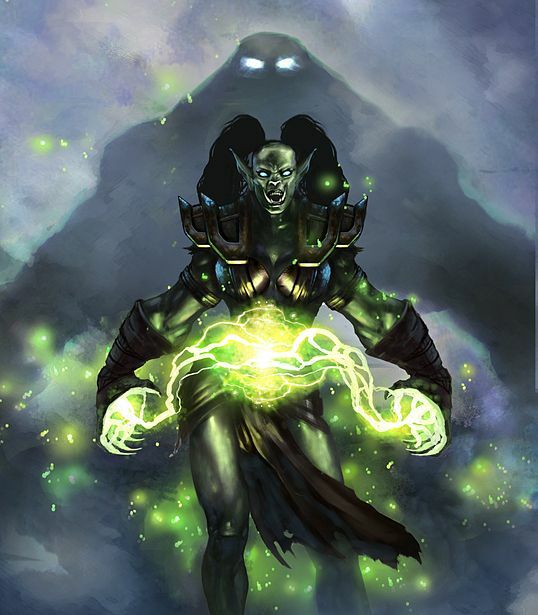 Even though we are not really a Spirit based class, the more we have, the more mana we can recuperate with Imp Drain Soul. Save your money!! Since we dont have to purchase a mount at lvl 40, we are in an advantageous position that we can spend that money on gear. Only spend money to level Corruption, CoA, Siphon Life, Lifetap, shadowbolt, demon armor, soul stone, health stone, and your VW books. And start saving your money for some of your pre-raid BiS gear that is BoE. IE Felcloth Gloves. You've just hit 60, congrats!! Now what? If you want to continue to quest grind for gold, rewards, and rep, by all means keep your same spec and go to town. However, if you find yourself with the inclining to start running dungeons for loot and eventually getting into a raiding guild, here is what you should shoot for. SM/Ruin - DoT EVERYTHING with corruption, spam shadowbolts. Pros: Higher survivability outside of raids and dungeons because of Siphon Life. 5/5 Imp Corr DS/Ruin / 5/5 Suppression DS/Ruin. - Sacrifice succubus, pretend you are a shadow spec mage bot that spams shadowbolts. The following is the current 1.8 BiS Pre-Raid gear for warlocks. With the addition of ZG, I classify any non-40 man dungeons as pre-raid. If you engage in the glorious act of PvP in your spare time, then you should strive to get the following Rank 10 PvP gear pieces, Champion's Dreadweave Cowl and Champion's Dreadweave Spaulders. From this point forward, MH/OH will be definitively better than 2H (until Staff of the Shadow Flame off Nefarian 0.0!!!). Ranged: Skul's Ghastly Touch, Touch of Chaos, +21 "of Shadow Wrath"
Starting off, face it, your DPS will be abysmal. Accept this and move on. Two cheap options that are an effective DPS bump while working on youe gear: Lesser Wizard Oil and Arcane Elixirs. Both are relatively cheap on the AH and have a combined +36 spell damage. The oil will also last through death. Choosing which professions you want to pursue with your warlock really boils down to what you want to be doing when you reach endgame. Here, i will go over each profession and summarize my personal choices at the end. Gathering Profesions: Typically chosen to either support a Production professions or as a source of income. Herbalism: Along with mining, a fairly easy profession to skill up while playing. 'See node. Gather node'. At higher levels and at endgame, a fairly good source of income if you are diligent. Flask mats are always in high demand. Mining: Along with herbalism, a fairly easy profession to skill up while playing. 'See node. Gather node'. Endgame mining for warlocks is a fairly poor choice. Skinning: In the same vein as mining (kek, puns). Unless you are supporting another toon with your Skinning/Leather working, leave those professions to the leather wearers. Production Professions: The meat and potatoes of your endgame profession selection. Choosing, or not choosing, some of these have drastic effects on endgame results. Alchemy: A good source of income if you can land a few rarer recipes (see flasks). Also takes a buisiness-like mind and mentality to watch the AH and know when to buy and sell (mats and pots). Also gains access to transmutes. Enchanting: Good for some side cash (selling DE's) and leveling up with tailoring (DE what you craft). Can be expensive to level up, and the endgame payoff is limited. Unless you land a very rare recipe (see +30 spellpower / +55 healing), you are only going to be making money off tips. Engineering: An absolute MUST if you are going to be a serious PvP'er. The trinkets and gizmos you gain access to are numerous and entertaining. What have we learned? If you PvP, take Engineering. If you PvE, take Tailoring. Those are the only rules. Your 2nd profession is really up to you and what you enjoy doing? Me personally? I have Tailoring, and am about to drop Enchanting for Alchemy. The below is the Bis of the Bis, universally accepted, diligently theory-crafted, Xashe approved. With the release of BWL, and some +spell hit gear, we finally have a sturdy base to build on. I've started a list of the primo BiS from now till the end of vanilla, broken up into the upcoming patches. **Depending on your +sp at this point, some argue that Ring of Unspoken Names+Seal of the Damned > Ring of the Fallen God+Seal of the Damned because of the extra crit. Your mileage may vary, test both. The 2/8 set bonus (Your Shadow Bolts now have a chance to heal you for 270 to 331) is always reached since Tier 3 head, chest and boots are best in slot items. The 4/8 bonus (Increases damage caused by your Corruption by 12%) is very easily reachable with Plagueheart Shoulderpads, meaning that the set bonus worth discussing is the 6/8 bonus (Your spell critical hits generate 25% less threat. In addition, Corruption, Immolate, Curse of Agony, and Siphon Life generate 25% less threat), extremely handy in threat-sensitive fights. The 6/8 T3 set bonus is most effectively reached by adopting the Plagueheart Belt and Plagueheart Gloves over your Eyestalk Waist Cord and Dark Storm Gauntlets. Ensuring you have the proper enchants on your gear not only will ensure you are maximizing your DPS output, but will also make sure you are taken seriously. I can't begin to tell you how many times I've seen AGI enchants on gloves or Spirit on bracers. I hope this helps all you new leveling warlocks, or help redirect some of you who are having problems leveling. Last edited by Botmaster5 on Sun Nov 05, 2017 2:45 am, edited 56 times in total. *Edit 6/30 - Updated talent snapshots to point to db.vanillagaming.org. Fixed talent progression and recommended quests (thanks Numi). Added drain soul macro (thanks Vikterion). *Edit 7/30 - Corrected BiS to reflect new BiS gear, "of Shadow Wrath"
*Edit 10/13 - Cleaned up and reordered some items on Pre-Raid BiS, Added AB/WSG pvp gear to pre-raid BiS, removed Ranked PvP gear form pre-raid BiS and added Champion's Dreadweave Cowl and Champion's Dreadweave Spaulders to a special sidenote. *Edit 11/29 - Updated pre-raid BiS to include items from ZG and ZG rep. Changed the shade of blue to make it easier to read. *Edit 3/7 - Removed 'PvE' from title to avoid server confusion. Added links for older content gear lists (1.3 and 1.5) Thanks Soulxlock & Guybrush for the links. Last edited by Botmaster5 on Tue Mar 15, 2016 1:34 pm, edited 21 times in total. Thanks for this. I really suggest the warlock robes quest as well, since the reward is so good that you might keep it till 50 or so. I also suggest the Wailing Caverns quest staff reward since it is exceptional good. You need to run the instance once (I know it is a real pain). I wonder of your leveling speed this way. I mean with VW you cannot kill more than 2 mobs easilly unless they are green. Have you considered switching to succu when you get shadoweave gear and multidot/life drain? Improved Drain Soul is crucial to maintain uptime at levels 30+ and at roughly ~35 youll get really punished by going full affi, because your void is going to lose aggro and go oom way to quickly, which either forces you to drink or stand around waiting for your void to regain mana. The aim is to improve void walker aggro before the crucial level 35, then to focus on damage and efficiency. Before SM theres not a lot of efficient talents that you need to improve your kill per hour (KPH), the main gain is improved drain soul. The way you play this specc is by pulling the next mob as your current one drops low, and then when you just finished dotting your new target you drain soul the previous mob, it dies and then you wand the next target. Once you learn to time this properly and are farming the right kinds of mobs (often raptors before level 40), youll easily pull ~130 KPH. Its so efficient its rivaling pure questing for me, 27-32 I farmed because a level by questing was ~2 hrs 15 min and a pure grinding level was ~1 hr 45 min. Im currently level 39 on my 2nd warlock on this server, my first is already 60 and I played the affi specc linked above, but the one Ive explained here has been much much faster, not to mention its only going to be faster from here on. Other than that, the guide is spot on, good work! Level 35 - Knowledge of the Orb of Orahil - Take the staff as the reward. DO NOT TAKE THE STAFF, the off-hand is BiS untill you can farm a well rolled orb from Sunken Tempel, its pretty important if you want to pve / pvp this expansion at all. Is it possible to fix these links? For me it's not showing any points allocated to any of the specs. Last edited by darkxiao on Fri Jun 26, 2015 9:11 pm, edited 1 time in total. From what I understand +shadow damage rolls will not ever exist on this server. Bis offhand now is umbral crystal or something, although if you're concerned with raiddps you should be using rod of the ogre magi. Improved drain soul tends not to be worth it unless you're good with pulling your pet off mobs before they die (if pet lands a KB you won't get a proc). General deletion of soulshards is fairly annoying to me, and I assume others feel the same way. I'm also fairly certain the voidwalker has garbage threat gen since...a few months ago, so I can't really comment on its ability to hold threat while leveling anymore, so I'm skeptical if it would really be worth it for the leveling lock especially considering the high amount of pvp action you'll be encountering while leveling. Would just like to point out that the level 50 quest for the Soul Harvester is not available yet. The first 2 parts are, but the last part that sends you to Sunken Temple hasn't been added yet. And it's unknown how long before the devs add it back to the game yet. StoneColdET wrote: Would just like to point out that the level 50 quest for the Soul Harvester is not available yet. The first 2 parts are, but the last part that sends you to Sunken Temple hasn't been added yet. And it's unknown how long before the devs add it back to the game yet. nervous wrote: From what I understand +shadow damage rolls will not ever exist on this server. Bis offhand now is umbral crystal or something, although if you're concerned with raiddps you should be using rod of the ogre magi. The voidwalker threat is perfectly fine with 3/3 improved void and some management, but it wont hold aggro without some effort. The problem with voidwalker threat is most likely that it runs out of mana, toggling autocast on taunt is key to leveling a warlock and youll already _need_ to manage your pet enough to make it efficient that the improved drain soul is not going to be any extra work. Oh and one more thing regarding voidwalker, if your pet is landing killing blows youre doing warlocks wrong, abuse your dots, the next target should be dotted and ready when you start the drain soul channel, or youre going to be wasting time overkilling mobs.